With enough water running on the surface for long enough, we can have an abundance of wet-weather plants, including some in the mint family. 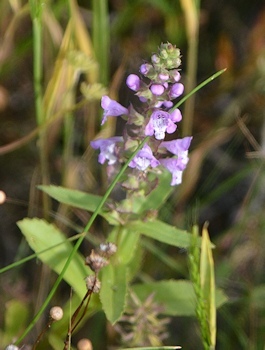 One of the showiest is obedient-plant, which we transplanted planted a shovel-full of from a wet area about to undergo "development" somewhere else. It grows several feet tall, if it's really happy--always at least 18 inches--with these big, glowing, lavender flowers that catch the light. Bees love it. The honeybees wrestle their way inside from the front; bumblebees more often bite a hole near the nectar. It has slowly spread over the years since we introduced it--faster in wet years, of course. Right here it's growing with wild onion (at the end of its flowering) and is overlapping other flower types the bees enjoy. 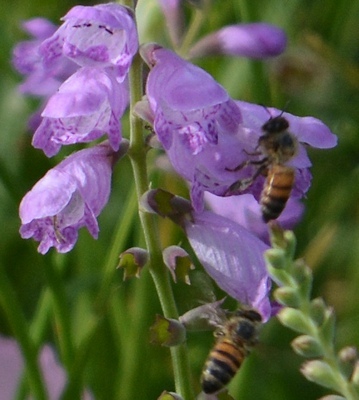 Bees were too busy toward late afternoon to let me catch them on anything but the obedient plant. Although I didn't photograph bees on anything but this, I did see quite a few butterflies and caught this one on Queen Anne's Lace. 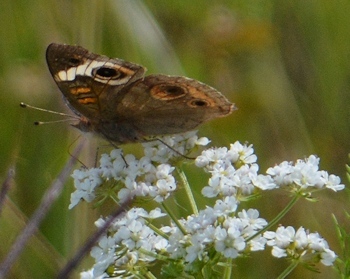 It's a Common Buckeye, with the sun coming through one wing. 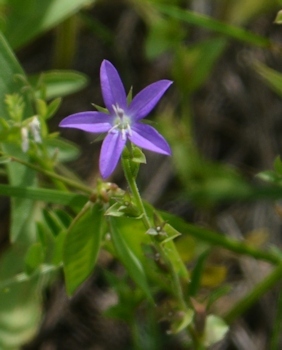 Also with a preference for damp soil--but not growing in water--is Venus's looking glass, a delicate little plant with purple star-shaped flowers along a single stem. We don't see these in dry years. The two together in a glass of water. 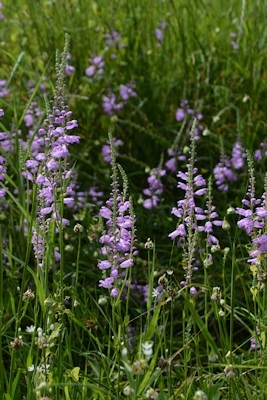 The Brazoria, the larger, is almost scentless; the tiny one, which has rosy-pink flowers that are darker red inside, grows thickly on damp areas of the east grass, is intensely aromatic. Some year I mean to collect leaves and try them in the kitchen--but they are tiny leaves. 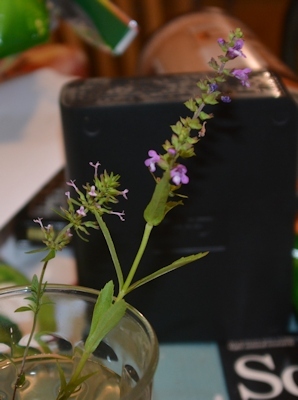 The whole plant grows only 4-6 inches tall. EDITED 5-8-2016. R- found an online photo reference. The small one is Slender Hedeoma, Hedeoma acinoides. It's the 333rd plant IDed on the place. 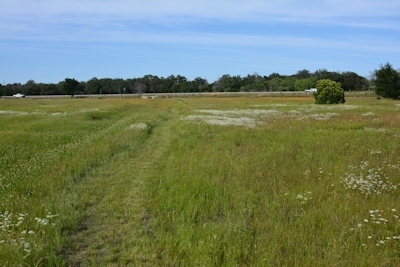 Upstream from the obedient plants and tallgrass clumps, the old ditch is full of wild onions with other plants mixed in, and the field itself has Queen Anne's Lace, gaillardia, and gold thread, with Brazoria under the grass in the damper spots. 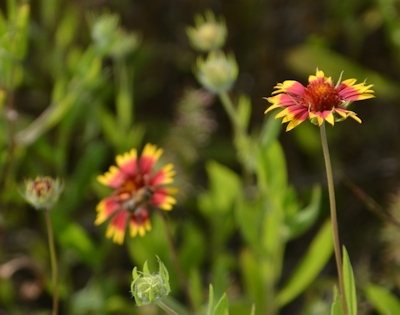 The gaillardias have not peaked yet, and the rudbeckias and other coneflowers haven't started. Gaillardia getting started--many more to come. Is the Queen Anne's Lace an umbellifer (sorry, it's not clear from the photo)? Yes, it is. And it may not be "real" Queen Anne's Lace but another in the same family...it's what's called locally Queen Anne's Lace, and I didn't key out the plant yesterday in my giant Manual of the Vascular Plants of Texas because...tired. Wanted to get pictures up. There are other relatives with the same sort of look, and I find them confusing when I'm not working with the keys frequently. Like now. Thank you. I wondered because it is a name used by some for the umbellifer I'd call cow parsley. It is common in the hedgerows of southern England where I was brought up, one of the things I miss living in the north. It is part of the smell of late spring, bringing the promise of summer, from my childhood. I also wonder if it's one of those names that get applied to things that look similar. I know in the UK there are common names that are used for different things in different arts of the country. I speculate that was even more likely to be the case in the USA, with people using the names they grew up with in Europe for lants that looked similar, but that may not have been the same species, but it is a guess. Please keep the photos coming. Love to see how the land is changing over the years. I'm glad to hear you didn't flood out. Houston took serious damage for the third time in a year. I'm starting to think we should do like the Galveston folk did a century ago and RAISE certain areas up a few feet. If our ancestors could do it with steamshovels, we can do it now. Houston's problems with water flow and heavy rainfall have been exacerbated by poor planning for at least a half century. It's gotten worse over time because the same poor planning has continued unabated. My great-grandmother lived there in the early 1900s; I lived there in the '60s, visited often in the '70s and watched the proliferation of hardscape force more water onto less land with predictable results. It's only going to get worse, and nobody's going to pay the cost of trying enough uplift to do any good. It has always had, and will continue to have, torrential rainfalls--12, 15, 18, 20 inches in a day at times. Even when it was a small city on a wide coastal plain, a seasonal marsh, it flooded, but not as badly because the water could spread out. Our ancestors had more resources to work with--not technological but natural resources--and a smaller problem. I know this is off-topic but I was just wondering if you had seen it. I envy you your firewheels. 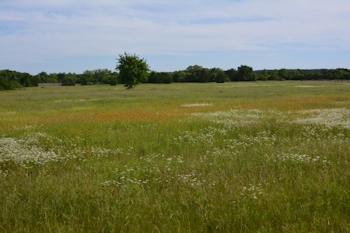 Our nature preserve has daisies & yellow gaillardia, but no firewheels the last couple of years, when there's been so much rain. They're wonderfully drought-resistant, but apparently don't handle rain that well. I'm glad y'all are able to enjoy the fruits of your years of hard work; thanks for sharing them! i am a huge fan of your work and tried contacting you via E-Mail, but didn't work somehow. So I hope that this will reach you. I have the small dream of getting a book signed and personalized by you (The speed of the dark is one of my all-time favorites). I would of course pay for shipping/trouble/etc. Would that somehow be possible?